The global cyclopentane market was valued at US$ 284,460.87 Thousand in 2017 and is anticipated to expand at a CAGR of 7.4% from 2018 to 2026, according to a new report titled ‘Cyclopentane Market: Global Industry Analysis, Size, Share, Growth, Trends, and Forecast, 2018–2026,’ published by Transparency Market Research (TMR). The global cyclopentane market is driven by rise in the demand for climate-friendly refrigerators from the consumer electronics industry. Europe accounts for a major share of the global cyclopentane market. Refrigeration has had a high impact on industries, lifestyle, agriculture, and settlement patterns. Refrigerators are used in kitchens for storing fruits and vegetables, salads, fish, and meat safely for long periods. In addition, they are used in the health care industry for storing a range of medical devices and products at low temperatures. Polyurethane rigid foam is the most widely used insulating material in refrigerators and freezers throughout the world. Cyclopentane is a cost-efficient hydrocarbon with good thermal properties, zero ODP, and low GWP. It is widely adopted in Europe and the U.S. as a blowing agent in PU insulation foam for use in refrigerators. Insulation efficiency of polyurethane foams is a key property utilized for low-temperature preservation of food during its processing, storage, and distribution to consumers. Hence, rising demand for residential as well as commercial refrigerators is expected to propel the demand for polyurethane foams and, in turn, cyclopentane during the forecast period. PU insulation foams blown with cyclopentane are ideal for use in residential refrigerators, as they consume much less electricity to cool food. Furthermore, they reduce carbon emissions and other harmful pollutants from electricity-generating plants that burn fossil fuels. Cyclopentane does not contain any hydrofluorocarbons (HFCs). It aids in significant reduction in carbon dioxide emissions. Cyclopentane is a more eco-friendly option for use in the foam-blowing process compared to its counterparts such as R134a and R245fa, due to its low global warming potential (GWP) of approximately 10 and zero ozone depletion potential (ODP). Rising demand for climate-friendly refrigerators that utilize refrigerant and foam-blowing agent gases with GWP of 20 or less and zero ozone depletion potential (ODP) is estimated to drive the demand for cyclopentane during the forecast period. Demand for cyclopentane for use in the building & construction industry as insulation, typically for thermal purposes, has increased significantly in the last few years. Cyclopentane exhibits excellent thermal conductivity, good adhesion to substrates, and mechanical properties even at low applied densities. In the building & construction industry, rigid PUR foam panels are mostly used to insulate flat roofs, saddle roofs, ceilings, floors, and walls. Rising demand from new constructions has augmented the demand for rigid polyurethane foam products and, in turn, cyclopentane across the world. The construction industry in Asia Pacific is expected to witness significant growth in the near future. Countries such as China, India, Vietnam, and Thailand have witnessed significant increase in the number of construction projects recently. These projects utilize polymeric foams in roofing, walls, flooring, and other structural applications. With rise in the demand for foams in these projects, the demand for cyclopentane for use as a foam-blowing agent is also anticipated to increase in the near future. Increase in environmental concerns led by rising carbon footprint and volatility in prices of raw materials has been prompting market players to develop better foam-blowing agents with low GWP and ODP. 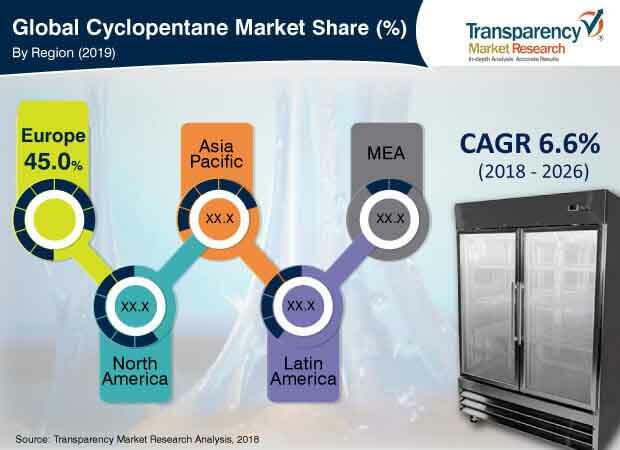 Rising demand for cyclopentane–isopentane blend for insulating materials for use in the manufacture of refrigeration products is expected to provide lucrative opportunities to manufacturers of cyclopentane in the next few years. Growing use of cyclopentane in analytical and scientific applications such as production of composite materials and adhesives and reinforcement of carbon fiber and fiberglass is projected to fuel the market for cyclopentane during the forecast period. Cyclopentane is a flammable liquid and its vapors can be explosive. This calls for specific fire as well as explosion precautions that need to be taken during its use. Cyclopentane must be used under extremely controlled conditions, due to its flammability. In addition, cyclopentane requires retrofitting with explosion-proof instrumentation, which translates into high capital investment. In order to ensure safety and proper handling of cyclopentane, special engineering companies experienced in the design and construction of storage facilities for cyclopentane are required. Increasing ingestion of cyclopentane by workers during the process of production can result in nausea and vomiting caused by irritation in their gastrointestinal tract. All these factors are estimated to restrain the demand for cyclopentane during the forecast period. Among products, the residential refrigerators segment dominated the global cyclopentane market in 2017. Rising demand for climate-friendly residential refrigerators is boosting the global cyclopentane market. Energy is lost through refrigerator walls and roof. This may incur additional operating costs. Use of cyclopentane as a foam-blowing agent reduces heating and cooling loss, thereby improving the efficiency of refrigerator units and building envelopes. Thus, energy saving, low GWP, and zero ODP are some of the features of cyclopentane augmenting the demand for cyclopentane in the residential refrigerators segment. Among regions, Europe accounted for a major share of the global cyclopentane market in 2017. Rising focus on disposal of old refrigerators containing CFCs or HCFCs and increasing pressure on manufacturers to replace their existing technology with the pentane technology in order to curb GHG emissions are augmenting the demand for cyclopentane in the region. In Europe, around 85% to 90% of all insulation foams are currently blown by using the cyclopentane technology, due to excellent insulation properties of cyclopentane and its zero ODP and low GWP. Key players profiled in the report are Chevron Phillips Chemical Company LLC, Maruzen Petrochemical Co., Ltd, HCS Group GmbH, Pure Chem Co. Ltd., INEOS Group Ltd. Haldia Petrochemicals Limited, Guangdong Dymatic Fine Chemical Co., Ltd., Trecora Resources, and Yeochun NCC Co., Ltd. The degree of competition among established players is high.